Dirty and not regularly cleaned mattresses become sources of skin irritations, spread bacteria, worsen asthma and allergy conditions and have many other bad effects. To have a healthy mattress that will serve you long time you need have it sanitised professionally. 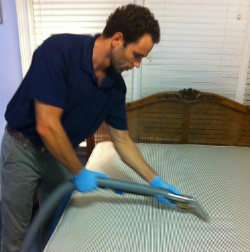 We offer steam cleaning of mattresses which ensures complete removal of dust mites, bed bugs, allergens and stains. The cleaning staff who work for us are professionally trained and have the required skills to implement effective mattress cleaning which we provide in Chiswick W4 and in the nearby areas. Our mattress cleaning services guarantee excellent results and will ensure you a healthy nights’ sleep. Rely on our staff of cleaners to remove the irritants and bacteria from your mattress using powerful and effective steam cleaning machines. They work with a small quantity of solvent that is dissolved in water and disinfects mattresses in depth. The cleaning will be started with inspection of the mattress, pre-treating of stains and removing them using suitable preparations. Then our staff will provide steam cleaning using powerful machines. They ensure deep disinfection of every mattress and leave it perfectly clean. In the end our staff will deodorise the cleaned mattress and inspect it to see the results of the cleaning. Use our efficient mattress cleaning services that are available in Chiswick W4 every day of the week. To maintain your mattresses clean and healthy you should sanitise them once every six months. Our staff of cleaners can provide the mattress cleaning which every customer needs. It is reliable, effective and leaves pristine and refreshed beds. Regardless of the mattresses type you have be it pocket spring, memory foam or other, you can rest assured that it will be sanitised effectively. Our mattress cleaning services can be used by the residents living in Chiswick W4 and anywhere around. We work during bank holidays, weekdays and weekends. Get in touch with us using our call centre or booking form.